Do you find yourself struggling when it comes to purchasing healthy, eco-friendly items for your family? I'll be honest, I have overwhelmed myself more than once researching items. Usually, this ends with me giving up for a time or needing my husband to help me since I'm being indecisive. With so much conflicting information out there, it's hard for us to tell the difference between clever advertising, scare tactic marketing, and truly healthy products with scientific backing. More than once, I have wanted to find a company that was honest and did all the research for me. I didn't think a place like it really existed, until my friend Tara at A Spectacled Owl told me about Mighty Nest when she was looking for Back to School supplies. Curious, I headed over to their site and took a look. I was immediately blown away by the large selection of eco-friendly products, ranging from kitchen supplies to bedroom sheets. Since my husband and I travel quite a bit, I immediately went looking at some of their food travel stuff. Normally, stores that focus on eco-friendly items put all their attention on having only cute stuff for children, leaving adults with very little choices if they want something to pack food for a trip or just to pack lunch for work. I had never seen a place with so many options that were perfect for everyone. Wanting to know more, I reached out to Mighty Nest, who was excited to let me review for free a nice lunch set, perfect for busy adults like me. Knowing that my readers would be excited to see these items, I couldn't wait to get started! Never heard of Mighty Nest? In my opinion, they are one of the best kept secrets in the green community. They are a site designed for busy women and parents who are striving to not only find eco-friendly items, but educate themselves about products and the latest information out there that is relevant for keeping our families healthy. All the items in the Mighty Nest store were pre-researched by the Mighty Nest staff, taking the guesswork out of purchasing toxin-free, high quality items for your home. Best of all, every item sold on Mighty Nest is free from many common contaminants and potentially hazardous chemicals, like BPA, PVC, phthalates, lead (or other heavy metals), melamine, chemical flame retardants, and parabens. With a large social media community and a great staff, Mighty Nest has quickly become a place for everyone to feel motivated and empowered as they learn to live a healthier lifestyle. Maybe it's from my teenage years of loving anything Japanese, but I have a thing for Bento boxes. They are compact, cute, and seem to naturally hold the perfect serving size of most foods. 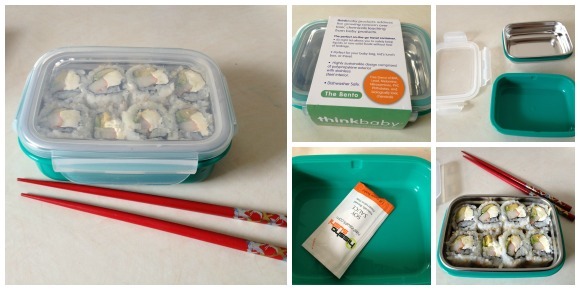 The ThinkBaby Stainless Steel Bento Box is fun and unique since it comes in a variety of colors. Most important, however, it is Bisphenol-A (BPA) free, PVC free, Lead free, Phthalates free, and of course, Melamine free. Personally, I love this design since it is dishwasher safe and perfect for traveling. The clasp lid is especially cool for eating in the car since it makes sure that liquids don't spill. I'll admit, I may be a traditionalist. For me, sushi is just one of those perfect travel foods. Its compact and easy to eat. Granted, I usually go for things that don't require soy sauce while I'm in the car, but a bento box allows you to throw in a packet if you are just dying to have it. For this trip, I'm planning to dump my soy sauce in the plastic green layer and eat my sushi at the park this afternoon when we bring my puppy Reya out for her afternoon run. If you are dieting, the Kids Konserve small stainless steel containers are perfect! These little containers are dishwasher safe and made from recyclable plastic and are free of BPA, PVC, Lead, and phthalate. Don't let the kid in the name fool you, these are containers designed for the whole family. I personally love these little stainless steel containers because they are the perfect serving size for Greek yogurt. Since they are leak proof, you don't have to worry about your yogurt getting everywhere, which is important if you are on the go. I have had many disasters where I was at truck stops or rest areas in the bathroom, trying hard to get yogurt out of my purse or backpack. In other words, not fun! The small size of these containers also make it possible for you to fit both of these containers easily in one standard sized lunch bag. For me, this means I can keep my granola separate so it doesn't it soggy and disgusting! I don't know about you, but one of the most annoying things for me when I'm on the go is dealing with annoying plastic bottles. Most of my bottles are eco-friendly, but can easily leak, making them a major hassle when I'm walking or driving. When I saw the LifeFacter Glass Water Bottle, I was quite excited! Everything on this bottle is dishwasher safe and non-toxic, making it perfect for people like me who are constantly on the go. Best of all, the silicone sleeve helps you keep a good grip on the bottle, while also protecting it against falls (klutzy me already found this out and nearly had a heart attack thinking she broke her new bottle!) Since it's glass, it is also great at keeping beverages cold longer, making it perfect for water or one of my favorite drinks – chocolate almond milk! When I first saw this bag on Mighty Nest, I fell in love. I have no clue what it was with this Purple Dandelion Cooler Bag but it seemed to be made just for me. This purple bag is useful and fashionable, something you rarely see with eco-friendly products. While I love the design of this bag, I was more impressed when I looked inside. The bag itself is completely insulated and has a nice removable insert, allowing you to put an ice packet in the bag without it going anywhere near your food! Really, this is the perfect lunch bag for girls of all ages! Since I wanted more room today, I decided to forgo the insert. See how roomy it is inside? Want to purchase any of the items featured in this review? How about get some wonderful, eco-friendly items for your home? At Mighty Nest, keeping your family healthy and away from harmful chemicals is easy with their handpicked, curated items. To learn more about Mighty Nest and see their large shop full of amazing products, make sure to check out the Mighty Nest Website! 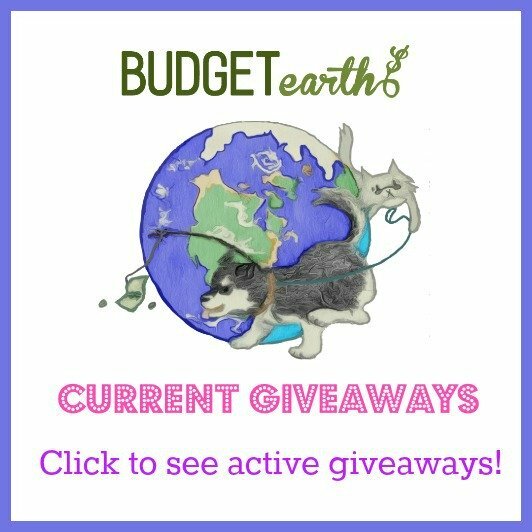 Disclosure: Budget Earth did not receive compensation for this review but did receive free products for review purposes via Mighty Nest. All opinions on this product are my own and may differ from our readers' opinions. Looks great wouldlove to win the set! These look like great products. I love the design on the lunch cooler! I like the fact that the bento box is stainless steel. I also like the small size containers, they come in useful for condiments. this is nice! I especially like the cooler bag and the water bottle. I recently started making bento lunches and having a good kit makes all the difference! When presentation and portability are key it's easy to make friut and veggies the star of your meal! I love this set. The stainless steel containers are sweet. i love these products! they look really cool. i would love to have these. I only use stainless steel for my daughter's lunchbox and this set would be a perfect addition to the few pieces I already have. I only have a few pieces at this point and any unused snack gets left in them so I run out of pieces quick! Would love to expand my collection! These are all awesome, and I can think of many things to use these for, We go to the beach alot, and pack our own lunches, so that would be the number one thing I'd use this for. I like that these are stainless steel – meaning they will last forever. I would love this for my own lunches! I love the way this set looks so earthy and retro.. I have been looking for a lunch bag for work and this one if perfect! it seems all the others are either just dotted or big huge flowers all over it or lines.. but not this one. this one is cool! I know! That’s why I was so excited about this one. Most companies seem to think us ladies want ugly bags! I love that this one is just so darn cute! I LOVE this set!!! Mighty Nest has so many fantastic things!!! Oh my goodness! This is so cute and totally chic. I love lunchboxes and I think this would be an awesome one to own- we live in Colorado and are always taking off for day adventire to the zoo, mountain hikes, etc, and it would be awesome to have something to take food along in. I have been looking for something like this for when my daughter goes to school. The place where she goes provides unhealthy foods, and we prefer to pack her lunch. I hadn't heard of them but love that they take the "guesswork" out of searching for products. There is so much misleading and confusing information out there. I end up being confused, lost, and unsure by even the terms companies are using. "Natural" versus "organic" versus "BPA free." So nice to have a company trying to help. This is a super cute meal package and contamination free. I get it ickys just thinking about a yucky lunch bag or container. I really like this lunch box set. I love the purple color and the glass water bottle is really cool. I've never seen one like that. It looks like it will hold a lot of stuff too! Anything that encourages me to pack my lunch is a winner! Wonderful products! I would love to have these to use for packing my lunch! This is a super wonderful review, I love the fact that the containers all fit! i love that your items are not only fashionable but that you have done the research to insure that all the products you offer are safe for the whole family. It helps for us busy families who don't have the time to research ourselves. I would love to win this prize…. I love the fact that everything is eco friendly, we really need more compaines who think for their customers. Sometimes life is so busy that we dont have time to do the things we are supposed to …. buying from this company would ease a little bit of that for me… thank you! I love the wa their pieces look…they're beautiful. I particularly appreciate the protected glassware…no you lies leaching into my drinks. Thanks for sharing. I love this set and what you are doing. Keep up the good work. This is great information here! I'm always looking for environmental friendly options to pack my daughter's lunch for school and mine for work. Not only are these containers great options, they are also quite cute! I'm sure dd would love to take her lunch to school in this stylish lunch box and awesome water bottle! I love this!This is just another way of helping to keep my family healthy.I love that there is no chemicals and are toxin free.I love the design on the cooler bag! 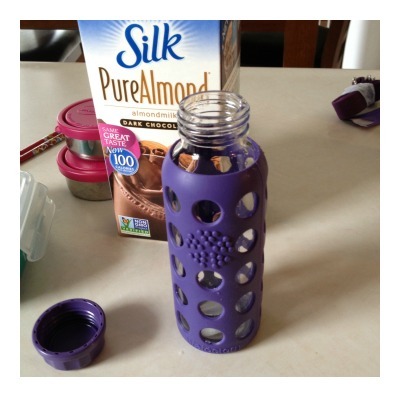 Cool stuff at Mighty Nest, I like that they are eco-friendly and that they are toxin free items and of high quality I love the Purple Life Facto Water Bottle, as I love glass with the cover on it would not slip when cold and wet, Neat stuff. That set of products is lovely! I have a goal over the next 5 years to replace all of the plastic food storage containers we currently have with a mixture of glass and stainless steel. Glass for things that will be reheated, and stainless for food on the go! With 2 children, I am always trying to find something safe and easy to carry with me for days when I travel back and forth to games, practices, and work. These items look perfect for all this. I love the fact that I can look good taking these things items and feel good because they are environment friendly! This is such a good set! It will be perfect for school or work! Great review! I love Might Nest products and am glad to see a good review of their items and customer service. I don't think you can go wrong with the glass water bottle- I love mine (but could always use another!!) Fingers crossed on the giveaway cause mama would like a cute lunchbox of her own. This sounds like a fantastic company! And how perfect to learn about them just before school starts…these look so much better than what I've currently got. I really like the bottle, as it looks like it would stand up to quite a bit of traveling. I love these! So pretty! I pack my and my husbands lunch almost every day and I am so sick of smelly plastic containers. No more of those! Thank you so much for the review! I agree that the amount of information out there is overwhelming and this article helps a lot. I had some stainless steel containers given to me years ago and I loved them. I wished I had more and never researched on where to get them. I also love the bento box ideas. Thank you again. Thank you so much for this giveaway! I love that it's a set from with different items and something everyone can use daily!!! My daughter would love one of these water bottles for school. I love all the cool colors. I love that there are no chemicals and are toxic free. This looks fantastic! I've been looking at bento boxes, but they usually have plastic containers so I don't buy them. I do have what I had thought were stainless steel tiffins, but they rust so they must be really low grade. Love the look of the glass water bottle and the cooler bag too! I really like that their products are eco-friendly. That is something that is very important to me. I loved this review. Keep up the great work! what a great collection of products they offer. i love the cooler bag and the glass water bottle. It has always been exceedingly difficult to find the right products for my families packed lunches. Most things I have found either didn't work well or were not very attractive. This set is beautiful and I love the glass bottle with the silicone sleeve! Thanks for sharing this site. I particularly like the water bottle – like you, I prefer glass, and I do worry about breaking my recycled glass lemonade bottles. I went over and browsed the site and found the perfect little set of stainless steel dip containers, too. I always worry about my salad dressing leaking out into my lunch bag. Thank you SO much for this review! I have never heard of Mighty Nest & never would have were it not for you. What an awesome company & idea. Definitely going to be adding them to my favorites. I love the fact that they are BPA, PVC, phthalates, lead free. 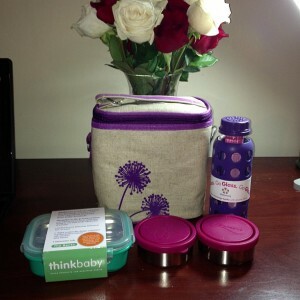 It is hard to find food containers for my kids lunches that are made with chemicals. Also the dandelion cooler bag is absolutely adorable! Being a teacher who needs to be able to pack a lunch I love the look of these products. I think that they would defiantly fit well to my needs and help me in my everyday life. My daughter is not old enough to need a packed lunch yet, but my husband could take one to work. However, I would love to use this stuff for myself!! I could pack a picnic or a lunch when I take my daughter on outings. Great products! We use stainless steel and glass products. They are very durable and easy to clean. For packing lunches, glass products are microwavable, so they come in very handy. I struggle with finding nice-looking things that are eco-friendly. And so often you have to only handwash. I love that you can put these in the dishwasher! I have been using plastic bento boxes for the past several years but really like your stainless steele set and the glass bottle. I am very impressed with the thought that has gone into your products. I would love anything that is Eco-friendly. Right now I do not have a way to carry my lunch to work besides a plastic bag and I feel like I am being wasteful by having to throw it away every day. I would love one of the totes from this site! Wow! What can you say? This truly has it all…style, function, purpose. What a lovely set. Would make a perfectly lovely gift, but how could you give it away! I would love to try these products. I really love that they are eco friendly. The Dandelion cooler bag is really cute! I love to see what products people come up with that are green! It just blows me away! Those look like handy containers. I like the stainless steel and water bottle. This looks like a good lunch solution to the tiny bento boxes. We love the idea of bento lunches but I couldn't find any of the systems that were big enough to pack a substantial lunch. I thought the insert was the neatest thing too! I am seriously considering buying the larger version of this bag since its meant for things like family outings. I could see it being very useful during car trips too. Good to also meet another bento hoarder! I like the idea of eco-friendly products. I always pack my sons lunches and my own lunch as they did not like buying their lunches. So many choices to chose from. Happy to have found a new site to read. Thanks! My granddaughter starts school this year and I'm happy to say that she won't be buying lunch from the cafeteria. This of course means that my daughter-in-law will be packing her lunch each day. I've been searching the stores trying to find safe packing containers to little avail. I can't wait to order some of these containers. I just hope they come in purple. I love locking containers to keep my beads and other crafts things neat. I suppose I could use them for food as well. I love the boxes, and they ar egreat not just for lunch boxes, but for everyday storage. As I get rid of my plastic storage, they are being replaced with proucts like these! I love this. I can use it for my son's lunch for school and for leftovers around the house. I would love to give it a try! First of all I love the purple dandelion bag! It is so quaint and cute. I also really like the stainless steel containers. As my son is starting solid foods we are looking for ways to carry some snacks around for him and these seem like they are perfect! I worry about the different chemicals in containers these days. I think this is awesome that it's chemical free and a cute design to boot! that would make taking lunch so handy. I love purple so the lunch bag and water bottle would be perfect. This looks like an awesome set that would help so much for lunches for the kids…. They also Love anything that is colorful and these seem to fit the bill 🙂 Would love to win! The water bottle is one of my favorite items. I was nervous about having glass at first but you really have to TRY to break it! i love this patern dandelions are so pretty. also love the purple!! i neeed thisss! Love the fact that these come in different sizes. Being stainless steel is a bonus. Thanks for the opportunity to win this. I love everything about this…I'm so into gadgets…love trying new things all of the time. It would be neat to win this giveaway. I could really use these. I love that 15% of order totals go to local schools AND all the products are earth-friendly! I will definitely be buying from them! The bento box is compact and would even fit in my purse for a snack. I like the Kids konserve small stainless steel containers look to be perfect for salad dressings for my hubby's lunches. I really like the Dandelion design of this lunch pack! I would love to use this when I go back to school as a 2nd grade teacher. This would be a great idea to save money. You could take your own lunch and save a lot This is a really nice set too. You could take just abour anything in this set. back in the day, I wouldn't have thought twice about lunch containers. Unfortunately, due to the chemicals and problems they cause, I've become much more aware of what I shouldn't use for the family. My daughter takes her lunch occasionally as do I, and this company has lots of great things to keep our lunches packed and safe to eat! I like the stainless steel bento boxes. I pack my lunch for the same reason. I have had too many scares with food products that contained peanuts or worse, peanut oil! Thank you for the review! I've been in the market for bento boxes for my husbands lunch, but they're all so expensive that I didn't want to drop the money without knowing about it first (and who can honestly trust amazon reviews..?). I trust some Amazon reviews but I only give them value if I see the little icon saying they were purchased on Amazon. I was surprised just how much I could fit in this container! The glass water bottle with the sleeve is amazing! I try to avoid plastics ( even ones considered "safe") so the idea of having a portable glass bottle is pretty fantastic! I love the fact that you pointed out in your review that it can handle a fall – a HUGE plus around here with my family! Great review. This is really nice set. My teenage daughter would carry her school lunch in this. I love the design on the lunch bag. Thank you for the review. This is a wonderful set of of products that would be awesome for lunch or any outing. Especially love that they are safe from harmful chemicals. It's so nice to be able to go to a website and have faith that everything they sell is safe for your family! There sould be more retailers that you can trust, like this one, out there. I love Mighty Nest! They sell this wonderful product called a PieBox, for taking pies on the go and keeping them safe. I'm definitetly going to order one for the holiday season! AHH! I love them. I want to use it for sushi! I'm having a craving for some now! I'm all about living healthy and helping to preserve our environment for the generations to come. I'm teaching my kids about these benefits as well. Mighty Nest has some great products that I would love to have. I love this bento box, it's very stylish! And small snack pots that don't leak are invaluable for kids lunchboxes! we love our lifefactory bottles! we use the sippy lids for my son… if they can hold up to a 14 month old throwing them, they're worth the money! I love the design and the color of the bag. These are fantastic! I love the pattern on the cooler bag. The water bottle is great being glass instead of plastic. No more chemicals leeching into the water! never thought about healthyier ways of packing lunches. Something I need to start thinking about. My son starts preschool soon and we'll need to pack his snacks since he's gluten free. This looks amazing and I'm always looking for better, reuseable lunch packing items!! thanks for the review. It really opened my eyes. I never thought about packing lunches. I do use the hard plastic containers and since they weren't getting heated in there never thought about it. I like that this company is a green company. Great design and functionality. I love green products and try to use them as much as possible. Thank-you for the opportunity to win this. HUGE environmentalist here ( and bento lover! ), but I was somewhat dissapointed to see some of the prices. Being earth frendly and on a budget can lead to some creative thinking and I find myself improvising rather than buying prodicts like these. Don't get me wrong though, I would totall suppoert the products if i had the means to! A lot of it is also because all their products are made here in the United States. You usually have to pay a bit more for products made here since the companies can’t use slave labor (or at least close to it). I personally thought they were comparable to many of the plastics products that are made here in the states. I love eco-friendly things! These lunch boxes look great! I just love all their products. I really like that they are eco friendly. Thanks for reviewing their products and now I am going on their site to do some shopping. This is a great set! I LOVE the stainless steel containers. I have so many plastic containers that are permanently stained and marked up. It seems like these contaiers will really last! These eco-friendly products look very nice. Thanks for the interesting and informative review! beautiful set! this would be perfect for my lunches at work!!! What a wonderful product! I love the bento box, especially. 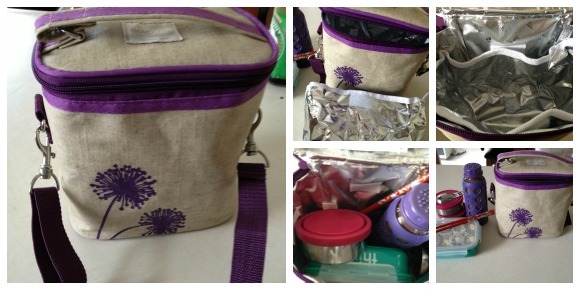 I love the purple flower lunch bag! I may get one for myself! I like the idea of a glass protected water bottle. I've searched high and low for a container that I can keep hot and cold drinks in, with no plastic. These are great! I love the stainless steel reusable containers! Thank you for these reviews. I had a glass baby bottle i loved it, it broke after my baby dropped it =( Also love stainless still containers. Bento box is something my husband wold love! All very VERY good products! These are really cute sets! Sarina loves soup and crackers during the winter for school. But this set would fit me perfect! I've been looking for a set of bento boxes I can pack a school lunch in. This looks like a brand worth a try…love that it's spill-proof. I can't imagine preparing sushi ahead of time, though!